Is the Pluvius thingie fettling factory, situated at the very spot where Emperor Hadrian fell into the Tyne, gasping its last? Are the denizens of Lastfort to be severed after a hundred years from the industry they love to loathe? Or can they cocoon themselves in a time warp and preserve their cherished anathema? The answers to the above questions may or may not be found in The Chocolate Cream Society , the first published novel from that master of comic surrealism, Leonard Barras, whose short stories and other pieces are regularly featured to hoots of acclaim on BBC Radio 4. 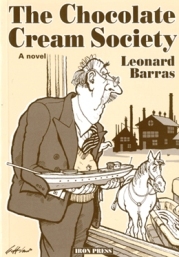 The Chocolate Cream Society is out of print.